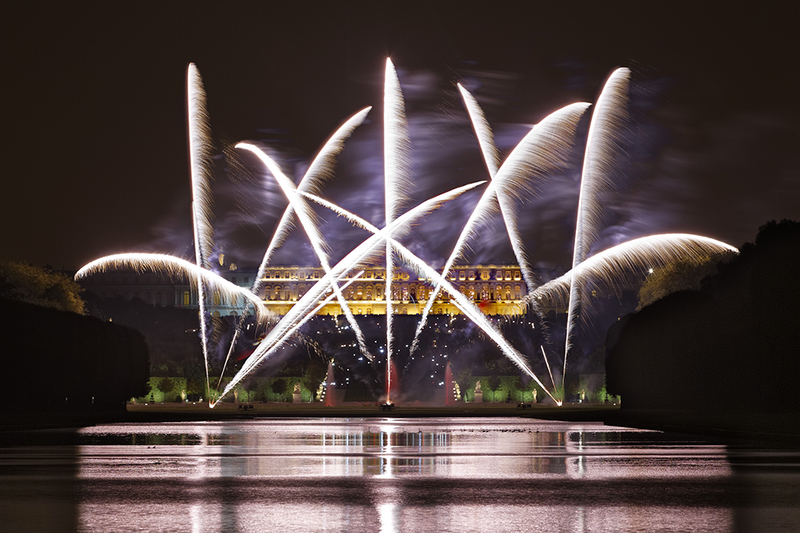 “A magical evening that surpassed our expectations!” is how a young American couple from New York City described their experience of the Night Fountain Show that runs every Saturday night from 8.30am to 11pm from June 16th until September 15th in the gardens of the castle of Versailles. 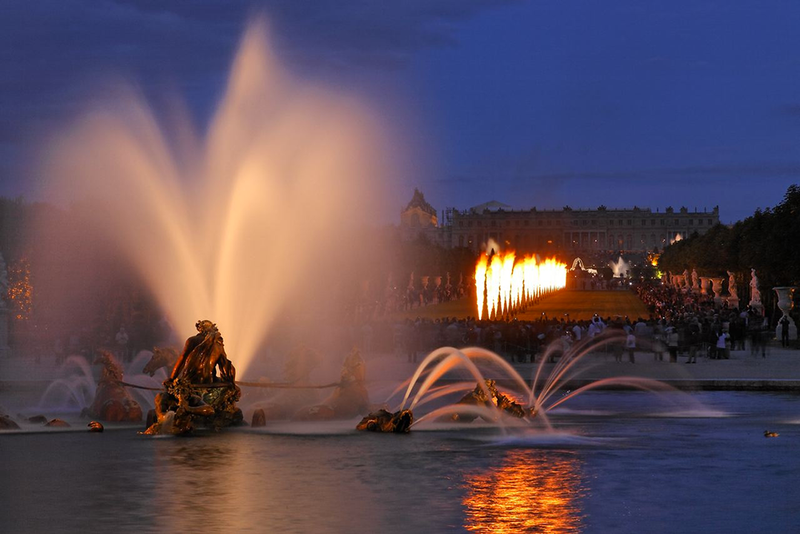 On June 23th, our team pick them up at their hotel in Paris with a Mini Van Mercedes and our guide Anna Maria took them to the palace for an unforgettable experience in the gardens of Versailles! At night, this very unique experience combines the extravagant backdrop of the castle, with the more natural, yet exquisitely designed gardens by Louis XIV’s landscape architect, Andre Le Notre. His work represents the height of the jardin a la Francaise or French formal garden style. Just as the castle’s design and décor reflect Louis XIV’s desire to show the best of France’s artistic and architectural achievement, the garden is an extension of this vision to surpass anything that had been done before, in terms of scope and scale. From the famous Hall of Mirrors, one can appreciate the Grand Perspective, a long avenue through the garden that crosses a Grand Canal measuring 1, 670 meters long. This section of the garden alone took 11 years to complete. Once it was completed the area was used for extravagant parties, much like the garden show itself. It also served to allow the king to tinker with various sailing vessels, and when its surface was frozen, for skating and sledding. However it is walking through the garden itself, particularly on the days of the garden shows, that one can fully appreciate the vision that the king and his gardener fulfilled. There are no less than 400 sculptures, representing mostly Greek and Roman gods and goddesses, allegories, and classical themes. Just as the décor in the castle highlights the glow of Apollo’s rays, so too does the garden highlight particularly the mythological triumphant stories of the sun god through such fountains as the Latona and Dragon fountain, as well as Apollo’s grove. There are 55 pools and fountains to admire shooting 600 jets of water, which are all supported by a piping system that has been unchanged since the 17th century. Luckily for us, a more modern hydraulic system supports the original pipes, which allows all of the jets of water to flow at the same time, something that was not possible during the time of the kings. One truly feels transported during this event and can imagine the evening parties that the king provided the members of his court during his reign. There is a feeling of being a part of history with hundreds of other people from all over France and all over the world. 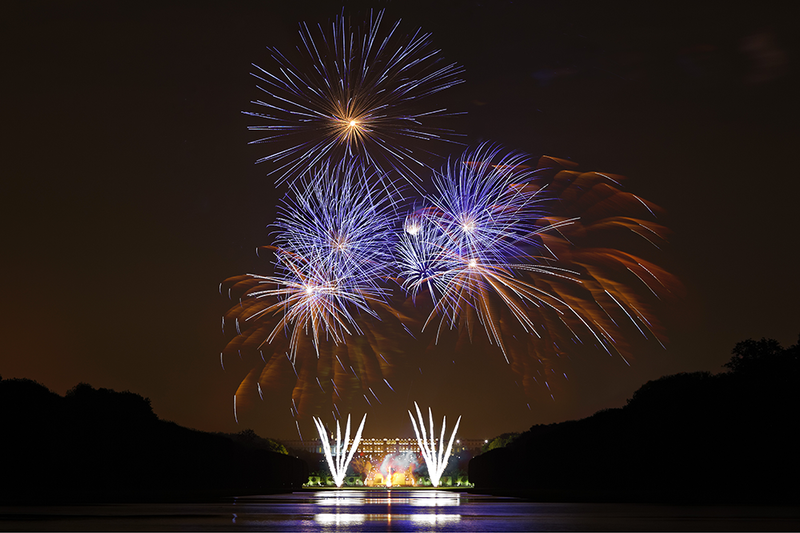 The finally of the whole event is a firework display which begins at 10:50pm and runs until 11:05pm. The fireworks are shot from the Apollo fountain in front of the Grand Canal. The lights are reflected on the canal and in the night sky. This is a perfect way to end a unique and very French experience.